This is a concept to use a material which responds slowly to changes of temperature, to provide a house with the summer’s heat in the winter, and winter’s cooling in the summer. Shown is a horizontal heat sink (sodium sulfate, concrete, etc.) which is insulated from the weather except for an exposed end at a distance from the house. The opposite end of the heat sink is exposed inside the house to radiate the temperature it was exposed to six months earlier. Thermally, the heat sink is 6-months long. Alternately, the roof of a house can be made of a material, the thickness of which would be chosen to have a one-day cycle to insulate the house during the day, and to radiate the day’s accumulated heat inside the house at night. In theory, the thickness could be increased to have a 6-month lag. This calls for using a large block of heat-storing material, sodium sulfate, etc., the size of which is chosen so that, due to thermal lag, it takes six months for the surface temperature to reach the center of the block. The heat sink (perhaps a cube 10-40 ft. on an edge), is made of a low thermal-conductivity material, ex. : concrete (thermal conductivity, k= 0.8) or salt, and has a hole in the top to the center, approx. 1-ft. dia. An insulated high-thermal-conductivity pole, acting as a heat pipe, typically made of aluminum (k= 205), approx. 8-in. diameter, is mounted at its base to in the center of the block. 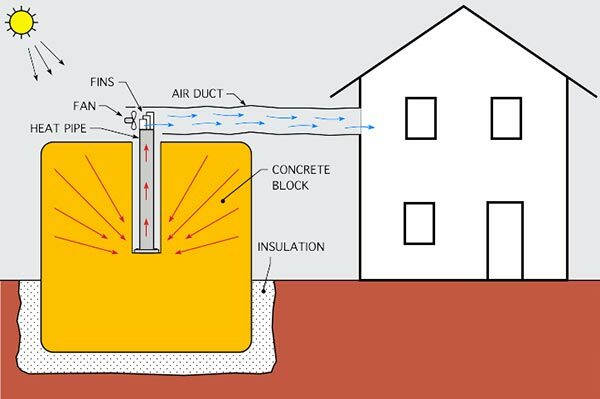 The pole extends upward above the top of the block, being topped by cooling fins in an air duct that leads into a house or building. In the summer the temperature of the block increases. As winter approaches, the outside of the block gets cold, but the center of the block remains hot due to thermal lag. The heat pipe conducts heat that has reached the center of the block to the top fins. A fan blows air over the fins to provide warm air to the house in the winter. In the winter, operating somewhat in reverse, the temperature of the outside of the block drops to that of the average winter day. As Summer approaches, the outside of the block warms up, but the center of the block remains cold. The heat pipe conducts any heat in the fins down to its base and into the block which acts as a huge heat sink. This reduces the temperature of the fins. When a fan blows air over the fins, cold air is blown into the house to provide air conditioning. 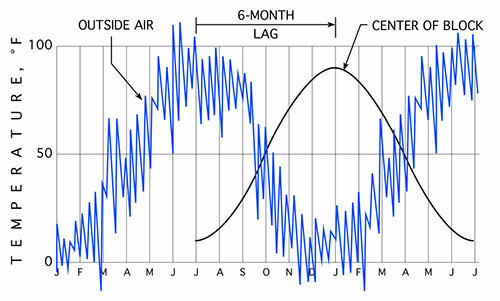 Daily air temperature fluctuates by approximately 20° (blue). The heat sink tries to reach equilibrium but is too massive to change quickly. The size of the heat sink is chosen so that it takes six months for the temperature on the exposed end to reach the end that provides heat or cold to the house. From that time on, the house receives essentially free heating and air conditioning.